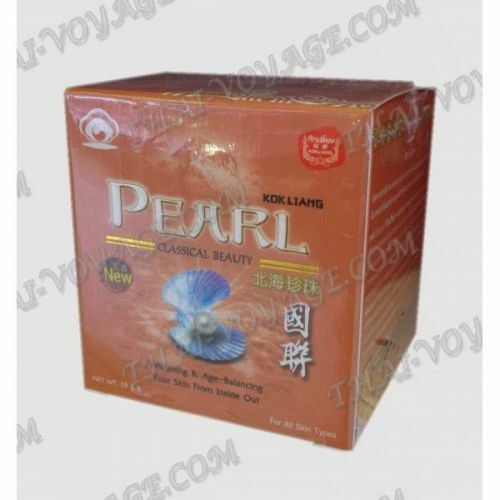 Pearl cream from an old Thai cosmetic brand Kokliang, containing natural pearl powder, vitamins E and C, aloe vera and oil peony care for every skin type. • The cream is very good moisturizes and nourishes the skin of the face and neck, helping to maintain the natural balance and restore the skin a healthy glow. • Reduces the appearance of dark spots and freckles on the skin. Pearl cream lightens dark spots, evens out skin color. • Has anti-aging effect - Kokliang cream, having in its composition of pearl powder, it has a strong antioxidant effect, smoothes fine lines and fights the signs of aging. • Protects the skin from the adverse effects of cold, wind, water and sunlight. • Pearl Cream soothes and moisturizes dry, chapped, sensitive skin. Pearl Kokliang cream - a pearl transparency of your skin. Active ingredients: pearl powder, Cordyceps, licorice extract, peony extract and aloe vera.